We recently returned from a month-long ministry trip to Europe. I will write more broadly about Europe soon, but first I’ll give a snapshot of Ukraine. One of the most striking things about Lviv (the cultural center of western Ukraine) and Kyiv (the capital) where I recently visited is their normalcy. When you walk down the streets, there’s a sense of summer relaxation and celebration. You would never think the economy is depressed and the country is at war. Cafes are bustling, violinists play, and even the police are smiling. But that’s just the outward appearance I can show through beautiful images on Instagram. When you take time to talk with people and listen to their stories, you learn their struggles and hopes. Almost everyone has a friend or family member who has been affected by war. We met with a young pastor and his wife who left their home in the east and settled in Lviv as refugees. They were grateful for the help they received from people in the church and their resilience and faith showed through their service to others while settling in a new city. A medical doctor related to me the story of a friend who served as a medic on the front. He and his company were surrounded by the enemy in a cornfield for more than forty days before they decided to break through the enemy line. A few of his friends died in the attempt. I also met with a young economist in Kyiv who researches market trends. She finds herself sadly alienated from friends in the east who are polarized over the issues facing the country. Ukraine is on the way to recovery, but people don’t feel it yet. Change is disruptive, especially if it’s positive, because it goes against the flow of deeply-ingrained mindsets and systems. Reforms that exist on paper are difficult to carry out when corruption has been normative on every level. Revolution requires zeal and often great risk. However, lasting change requires reform and those who lead reform must have patience and perseverance to communicate and carry out what they envision while old ways persist. On a personal level, C.S. Lewis wrote, “No man knows how bad he is till he has tried very hard to be good.” This is also true on the level of society. From the perspective of the Gospel, the heart of true change lies in realizing we are completely lost and unable to change apart from the grace of God through faith in Jesus Christ. God calls believers to be salt and light wherever they live, work, or study. Many believers are now in places of influence in Ukraine. While pursuing change, they must love and serve others patiently so the next generation will benefit. 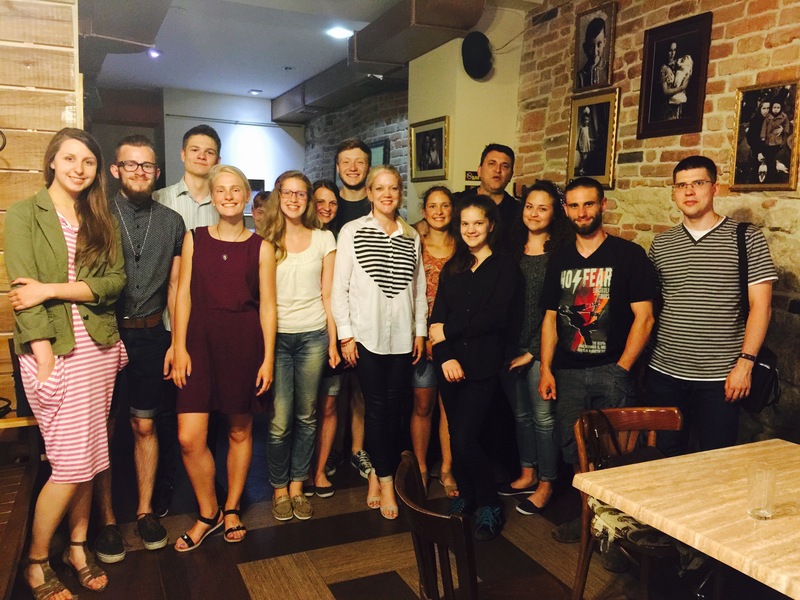 I remember the group of bright, young students we met in Lviv and pray for Ukraine’s future and for them, the future leaders. I don’t have statistics on church growth in Ukraine, but I was encouraged to see that our Every Nation churches are growing and remaining focused on the Gospel as the good news that can change lives. For that reason, Pastor Igor, Elina, and their team are becoming more effective in engaging youth and university students in Lviv. Pastor Oleg and his team in Ternopil have grown to two services and started a new church in Mikolayev through starting a rehabilitation center where they disciple men who have been addicted to drugs and alcohol. They also have the potential to start new churches in Europe as church members who have moved to find work start home groups. I honor the leaders and churches in Ukraine. I honor their faith, joy in the midst of difficulty, and commitment to follow Jesus and reach others. I honor their humility, hard work, and service. During turbulent times, I trust that God will be their refuge, their strength, their bridge over troubled waters. May we learn from their example because the church has historically flourished during difficult times – may the Gospel shine ever brighter.